Sony and Sprint have teamed up to offer Sony TX-series users integrated broadband connectivity courtesy of Sprint's Power Vision Network. Until now, Sony has only offered Wan connectivity via Cingular's EDGE network. The Sprint Power Vision, is based on the faster EV-DO Revision A technology and will give professionals broadband-like wireless connectivity. 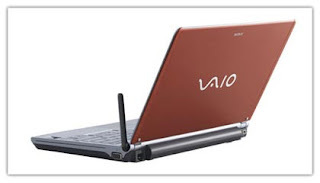 The VAIO VGN-TXN10 series laptops are ultraportables that weigh just 2.8 pounds and are less than an inch thick. All are Windows Vista Capable/Premium Ready and run on a low-voltage Intel Core Solo processor. Battery life is estimated at five to eleven hours. These laptops also include a dual-layer DVD burner, an 11.1-ich widescreen display, Sony's SmartWi technology for seamlessly integrating Wi-Fi and Bluetooth, and Sony's Instant Mode for indulging in your favorite movies or music without booting Windows. For the security-minded, a fingerprint reader is included, as well as G-Sensor shock hard drive protection for safeguarding the notebook against drop damage.Later this year, Sprint plans to upgrade its network in select markets with EV-DO Revision A technology, which will give subscribers 450-800 kbps download speeds and 300-400 kbps upload speeds. Sprint's wireless broadband network currently covers more than 157 million people in 216 metropolitan areas and 486 airports nationwide. EV-DO Revision A will reach more than 40 million people in select markets by the end of the year.